The Audix CabGrabber is an effective compact microphone mounting system for smaller guitar and bass speaker cabinets. An advantage when using the CabGrabber is you can place your microphone on either side of the cabinet and position it at any height. 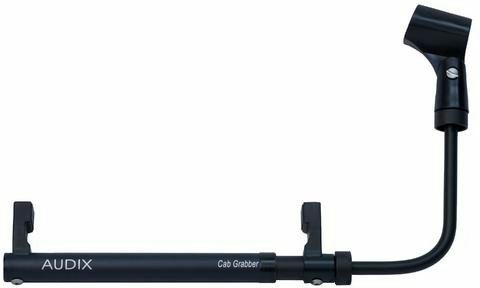 The CabGrabber can hold anything from a smaller dynamic microphone up to a large condenser mic that weighs up to one pound. zZounds is an authorized dealer of Audix products. Overall: Saves space, keeps mic in one spot! Love it! Just make sure you measure your cab first... I have a Fender Bassman reissue, and had to make sure I bought the smaller version. The bigger one says XL, but the regular version has no additional size notation. "Great Idea !! Made for the studio and Rode !!" Overall: Thge Grabber add's that litte extra that makes the difference between just hanging your Mic (with some brand's, as we know ) to a placement that is stable and secure, with the ability to be moved for differnt sound's from placment of your Mic to cab !! it also is Great because of it's easy mounting and dis Mounting for use with other cab's . In all I find it to be a Plus in both Live and recording situations. Style of Music: Blue's 60's ,Rock !!! 3 of 7 people (42.86%) found this review helpful. Did you?